All those currents in the gyres flow on the surface, though they often exert their influence over a thousand meters down. But the deep ocean is far deeper than that. Remember we said earlier that scientists, Lisa among them, have found North Atlantic Deep Water beneath the Agulhas Current? Remember, also, we said that water masses are distinguishable by their temperature-salinity fingerprint? (That’s why they take capital letters.) So how did water from the depths of the North Atlantic reach the southern Indian Ocean a world away? As late as 1960, scientists knew very little about the deep ocean, because they had no means to measure it. Much earlier, in 1751, Henry Ellis, captain of the Earl of Halifax, becalmed near the equator off the bulge of Africa, cobbled together about a mile of line, tied it to a bucket, and lowered it over the side. Mariners didn’t need to care what went on a mile beneath their keels, but Ellis was curious or maybe bored. The water he retrieved was cold, while the surface was extremely hot. Hmm. Why? How did cold water get to the equator? Time passed, and by the 19th century scientists were pulling up buckets of deep water and analyzing its chemical contents. The water samples contained plenty of oxygen, but water can only “acquire” oxygen when in contact with the air—on the surface. Scientists and mariners alike knew that a lot of hot water flowed north in the Gulf Stream System (otherwise Britain and Norway, given their latitudes, would freeze solid in winter). Scientists understood, too, that a basic principle of nature, the law of conservation of mass, insisted that if a quantity of water flowed north, then an equal quantity must return south. More time passed, and a theory evolved: Warm tropical-origin water flowed north where, chilled, it grew heavy (cold water is heavier than warm), sank, and flowed slowly south toward the equator. There it was forced toward the surface by other water sinking behind it, and, warmed, it flowed back north—another circle. “Convection” is the scientific term for the sinking/rising process. That simple version of convection grew suspect, but this general idea had hardened by the 20th century. It fit the facts, and since there were no instruments capable of measuring the deep ocean, it was good enough. Then, in 1960, the greatest oceanographer of all time turned his attention to deep-ocean circulation. Despite the utter absence of hard data, Henry Stommel (from Woods Hole Oceanographic Institution), concluded that the cold, deep water didn’t just seep south across a broad front. No, after sinking, it formed up into a tight, narrow current and flowed back south beneath the Gulf Stream across the equator thence into the Southern Hemisphere. He named it the Deep Western Boundary Current. This was an astounding leap of mind. Most scientific theories attempt to explain a natural phenomenon only after a critical mass of data has been collected. Here no data had been collected. But then Henry Stommel was not a typical scientist. That very year, a friend of Stommel’s, the British oceanographer John Swallow, was developing a float that could be lowered to a given depth where it would drift with the deep currents and electronically report its position to a nearby ship. 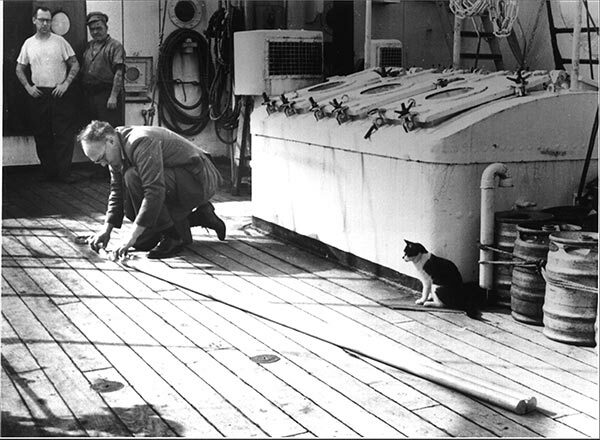 In surely the most dramatic moment in the history of oceanography, Stommel and Swallow went to sea together aboard the British ship Discovery. They dropped a series of “Swallow floats” beneath the Gulf Stream and waited for them to report their position. Gradually, one by one, reports came back: They were drifting south in the Deep Western Boundary Current. “The existence of the deep undercurrent flowing southward was quickly confirmed,” Stommel wrote in one of science’s great understatements. As technology advanced, scientists identified the sites where the sinking occurred. That North Atlantic Current (NAC) transports warm, salty water from the Gulf Stream into Arctic waters. Winter sets in chilling the NAC water, and because salty water is heavier than less salty water, it sinks, plunging over shallow sills into the depths of the North Atlantic, becoming North Atlantic Deep Water. Then it heads south in the Deep Western Boundary Current. 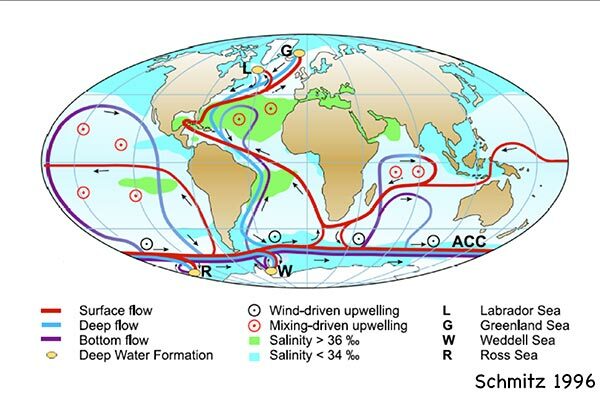 That process has come to be called thermohaline circulation. It’s a scary-sounding term, but it’s only a combination of “heat” and “salt,” the agents that prompt the sinking. It happens only in the North Atlantic and in the really cold seas around Antarctica. Indian Ocean water never grows cold enough to sink; and the Pacific is not salty enough. However, deep water created in the Greenland and Labrador seas makes its way aboard the Deep Western Boundary Current into the Southern Ocean and the deep Indian and Pacific basins. A small quantity of North Atlantic Deep Water (NADW) veers off to the north as it enters the Indian Ocean—and flows under the Agulhas Current. A degree of mixing goes on during this long, deep, dark journey, but not so much that Lisa can’t distinguish NADW from the overlying Agulhas Current water. Likewise, some portion of Antarctic Bottom Water, the coldest, densest in the world, enters the Pacific somewhere near New Zealand. The exact path gets a little sketchy, but eventually the deep, cold water makes its way to the surface in the Pacific. Remember that South Equatorial Current we talked about last week, the one that flows eastward across the Indian Ocean and runs into Madagascar? Some of the deep water, after it surfaces, flows from the Pacific through the Indonesian Archipelago (It’s called in fact the “Indonesian throughflow”) to become part of the South Equatorial Current, which, one might say, forms the headwaters of the Agulhas Current. And then some portion of the Agulhas water “leaks” around the bottom of Africa to join the South Atlantic Subtropical Gyre. A bucket-full of water that began its circumnavigation in the Gulf Stream, say, off the Florida coast would return to that very spot after about 1,000 years. During this quick spin around the world, we’ve thrown out a lot of obscure terms and geography; don’t let them confuse you. There is that important underlying concept we’ve stated before that any of us can understand—and appreciate. Everything in the ocean is linked to everything else. Surface currents are powered by wind. But no wind riffles the abyss. Deep currents are driven by differences in water density and by the force of Earth’s rotation. But in effect they are all arcs on intertwined circles. Together they have come to be called the Great Ocean Conveyor. Further, climatic conditions all over the Earth are shaped by this circular union of air and ocean.